Voted number #1 Eye Care Providers in the CSRA by the readers of the Augusta Family Magazine 2014. ​Thank you for this great honor. We really appreciate your confidence! Serving the CSRA since 1978. Dr. Broome is a graduate of the University of Alabama School of Optometry in Birmingham and has been in private practice for over 35 years. He is a member of The American Optometric Association and the Georgia Optometric Association. Dr. Broome is past-president of the Greater Augusta District of the Georgia Optometric Association. He is a Diplomate of the American Board of Optometry. Dr. Broome is an Augusta native, born and raised. Dr. Broome received several academic awards from Augusta State University where he did his undergraduate work as a Biology major. He received his Doctor of Optometry Degree from the University of Alabama School of Optometry where he graduated with honors. He was the recipient of the Harold Kohn Memorial Award and the Baush and Lomb Outstanding Contact Lens Clinician Award for his superior ability in fitting contacts and his overall performance in patient care. Upon graduation, Dr. Broome returned to Augusta where he began his practice of optometry. He enjoys serving the eye care needs of his patients and is truly grateful for their loyalty and friendship throughout the years. Dr.Broome's patients voted him "Metro's Best Optometrist" for 2008 in Augusta's Metro Spirit Newspaper. Dr. Michael W. Broome, the son of Dr. Paul Wesley Broome, is a Columbia County native. He received his B.S. degree from the University of Georgia and his Doctor of Optometry degree from the Southern College of Optometry. Dr. Michael Broome is a member of the American Optometric Association and the Georgia Optometric Association. ​Dr. Mike enjoys practicing the full scope of family eyecare, taking care of patients age three and up for all of their eyecare needs. He looks forward to meeting new and existing patients at Broome Family Eye Care! Regina Cutright Hamlin, O.D. joined our practice in August 2010. She was born and raised in the CSRA. Dr. Hamlin graduated from Clemson University having earned high honors and a B.S.in Biological Sciences. She earned her Doctor of Optometry degree with high honors at the Southern College of Optometry. Dr. Hamlin was recognized in her class by receiving the Outstanding Contact Lens Clinician Award and the Primary Patient Care Award. She is a member of the American Optometric Association and the Georgia Optometric Association. Dr. Hamlin welcomes patients of all ages, including children as young as two years old. She takes pride in her patient care and she strives to provide excellent care to each patient. ​Dr. 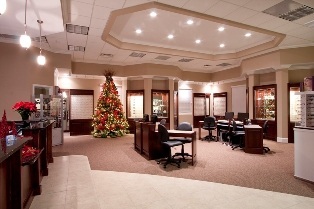 Hamlin's goal is to make your experience at Broome Family Eye Care one to brag about to your friends and family.